If what I read in the tabloids is true - granted, that’s a pretty big if - somewhere on a beach in coastal Florida Owen Wilson and Jennifer Aniston meander along the shore memorizing their lines for the upcoming theatrical release of Marley and Me. Surely you remember Marley and Me. Nearly every die-hard dog lover I know has read John Grogan’s tearjerker tribute to his dearly departed yellow Labrador retriever, Marley. In fact, while Jennifer and Owen wiggle their toes in the sand, John Grogan probably wiggles his in a giant pile of money from all his book royalties. Marley and Me did for dogs what Patrick Dempsey does for doctors every week on Gray’s Anatomy. Marley is the McDreamy of the canine world. A charmingly irresistible bad boy, breaking hearts and porta-crates the world over. And, in the process, giving a label to sweet dogs. Dogs who carry in the morning paper and deliver slippers with nary a drop of drool to their weary masters at the end of hard workday. That label is boring. B-O-R-I-N-G.
Gone are the days of loyal, steadfast doggy stars like Lassie and Rin Tin Tin. In this post-Marley era, if Timmy were trapped in a well, Lassie would be too busy licking herself to go get help. The dog-loving public would rather watch a dog eat a book than read one about a good dog. Yep, the bad boy is the dog du jour. The bigger and badder the better. I became all too aware of this in the spring I knelt beside my dear friend Connie watching her English cocker spaniel, Morgan, bring six snuggly puppies into the world. Breathless, I leaned over the blanket-lined kiddie pool where Morgan pushed and panted. Connie and I spoke in hushed whispers, but I was screaming with glee on the inside. My friend had promised me a show-quality puppy in return for helping her raise the litter. It was a "will work for puppy" arrangement. 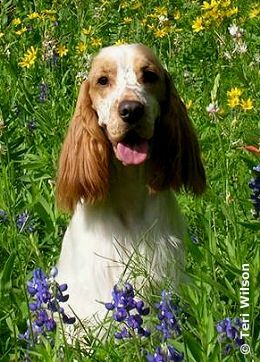 When the second puppy was born, she emerged with perfectly symmetrical orange spots on her snow-white little shoulder blades. "Ooh," I gasped, a tad too loudly. Connie poked me in the ribs and reminded me to be quiet. Being a librarian by profession, she’s rather good at shushing. "She looks like she has angel wings." We wondered if the wings would last, if they would stay so clearly defined when she grew older or if they would morph into one big spot. Stay they did. As Marley and Me climbed the New York Times bestseller chart, Morgan’s puppies opened their eyes, and climbed out of the whelping box. Ten weeks later the newly christened "Angel" came home with me. She was my first show dog and I had no idea what I was doing. Connie and her English cocker friends showed me the ropes, delighted in my unabashed love for my new dog and our enthusiasm for working together in rally and conformation. Sometimes there was some eye rolling at my fervent declarations that my Angel was the sweetest, most perfect dog ever born. I couldn’t help it. 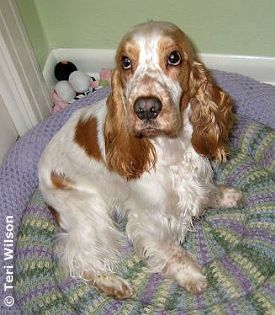 I had fallen head over heels in love with my little spaniel. I particularly loved the way she following me around wherever I went, our two shadows merging together as one. "It won’t last," Connie warned. "She sticks to you like glue because she’s a puppy. She won’t do that once she’s a dog." Her friends were eager to chime in. "You just wait," they would say with a snicker. "I had a dog named Angel once. Giving a dog a name like that is the kiss of death. She’ll turn into a demon before you know it." It seemed everyone had some sort of tale of terror involving a dog named Angel. And they loved repeating each and every gory detail. From snarling to biting to apocalyptic destruction. Their eyes twinkled with pride, delighted with the antics of their Marley-esque "Angels". "As I mourned his loss, Angel licked the salty tears from my cheeks, her constantly wagging stump of a tail pointing out all the life left in the world. All the things I had to be thankful for." I looked down at my own Angel leaning against my leg, her little paw resting serenely on the tip of my Nike. She blinked up at me with big, almond eyes full of innocence and trust. It was certainly hard to imagine her launching into a Cujo-like tirade, leaving a trail of tears and devastation in her wake. Still. I’d never had a spaniel before. Or a show dog of any kind. I was a novice. My entry for the rally trial confirmed it. Rally Novice A. You can’t get any greener than that. And the people telling me these horror stories were the experts. They had English cockers coming out of their ears. Some of them even walked away from the ring, leaving their discarded ribbons behind on ringside folding chairs. I, on the other hand, cherished every strip of shiny cloth a judge ever handed me. Even the ones proclaiming us second place out of only two dogs in my conformation class. I hung them all in a proud, fluttery display on my bulletin board above the desk where I wrote. So, maybe I really had no idea what was coming. Maybe the experts were right. And so I waited. Waited for the orange spots on Angel’s back to grow together and resemble a saddle instead of celestial wings. Waited to walk across the house one day without the click-click of toenails close on my heels. Waited to come home to find my pillows ripped to shreds, my shoes chewed beyond recognition. And while I was waiting, something rather extraordinary happened. Angel’s peach fuzz ears grew long and silky. Her downy puppy coat changed into flowing, soft feathers. Her angel wings, rather than disappearing, grew richer in color and shone like copper. She snuggled in the crook of my legs at night and accompanied me everywhere I went during the day. When my beloved Grandpa fell ill and I traveled to Houston to tell him goodbye, Angel came right along too. In fact, I still remember my Grandpa telling me in his raspy voice to "make sure and bring the dog." As I mourned his loss, Angel licked the salty tears from my cheeks, her constantly wagging stump of a tail pointing out all the life left in the world. All the things I had to be thankful for. She had grown from a puppy into a dog. A good dog. Despite all warnings to the contrary, Angel had become the anti-Marley. Will I go see the Marley and Me movie when it comes out? Of course. It’s a dog movie, after all. And I’ll laugh alongside every one else when the on-screen Marley makes a meal out of Owen Wilson’s drywall and tries to mate with Jennifer Aniston’s leg. I’m sure I’ll also cry when the troublemaker with a heart of gold breathes his last. 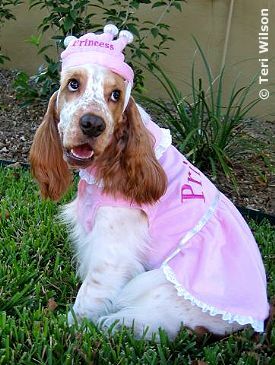 Then I’ll go home where my drywall remains intact and a little spaniel named Angel waits for me, dancing and twirling on her hind legs when I walk through the door. She’ll blink at me with sleepy eyes and yawn so big that it makes loud squeaky noises. She’ll lay at my feet, her warm chin resting on my toes while I sit at my computer and write a boring memoir that will likely never get published about my life with a sweet English cocker who never caused any trouble.